Learn the craft of songwriting from one of Australia’s leading artists and bandleader of Oh Mercy, Alexander Gow. The man behind Oh Mercy, is five albums deep and showing no signs of slowing down. His most recent, the heady & melodic, Café Oblivion finds Gow at his playful best. Café Oblivion combines the rich palette of the Aria award winning When We Talk About Love, with the bombastic, Aria & Triple J album of the year nominated, Deep Heat. 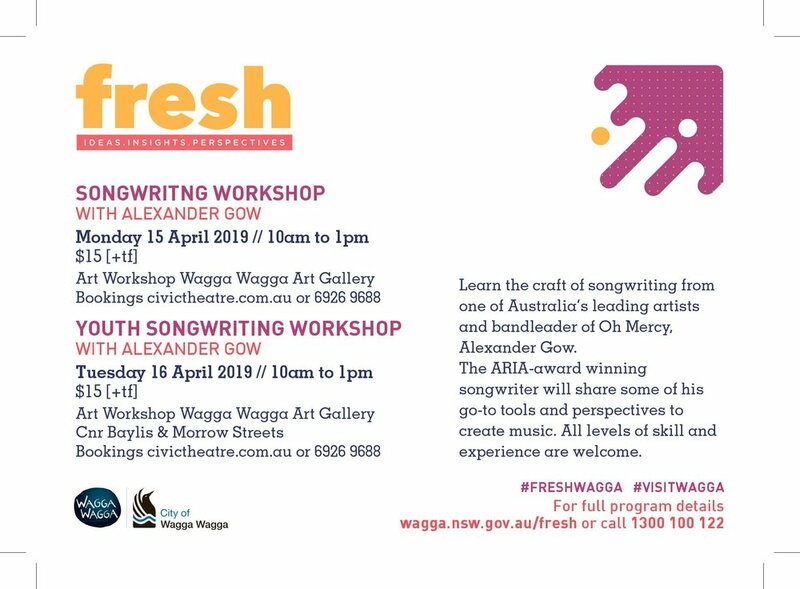 Emerging songwriters and composers have the opportunity to work directly with Aleaxander Gow at his Songwriting Workshop at the Civic Theatre in Wagga on April 15 & 16. The ARIA-award winning songwriter will share some of his go-to tools and perspectives to create music. Workshop attendees are encouraged to bring an original song to potentially share with the group, including a lyric sheet, guitar or easily portable keyboard. All levels of skill and experience are welcome. Tickets costs $15 and bookings for the Songwriting Workshop (15 April) and Youth Songwriting Workshop (16 April) can be made at www.civictheatre.com.au or by calling the Civic Theatre Booking Office on 6926 9688.